This is one of my favorite pork dishes ever. 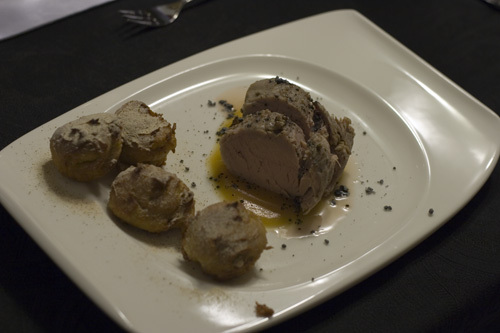 It is a scaled down version of one of the plated dishes found in Volume 5 of Modernist Cuisine and shows that with a little planning, scaling back, and luck anyone can make one of those dishes. There is such a variety of spices and flavors throughout that it will leave your guests racking their brains to identify all the ingredients. Most of the components can be prepared well in advance, making this an excellent dish for dinner parties. The pork can be made with or without the brine, but in blind taste tests conducted at home, the brined version has won out every time. 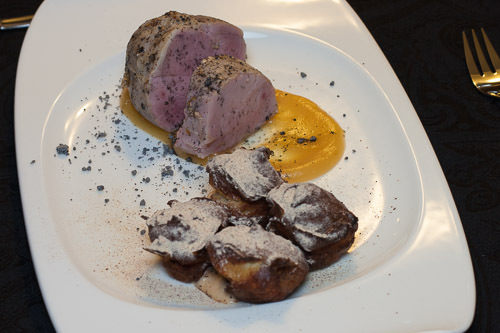 This dish is adapted from Modernist Cuisine. Grind the honey, salt, ginger powder, nutmeg, mace blade, and orange zest. 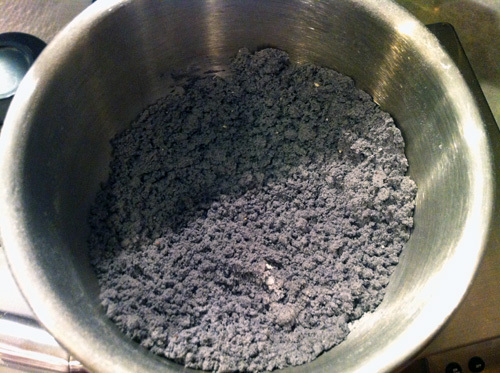 Blend the two powders together and reserve in an airtight container until needed. Whisk together the pain d’epices powder from above, the food coloring, and kaolin clay powder. Whisk the oil into the maltodextrin and once fully incorporated whisk into the spice blend. 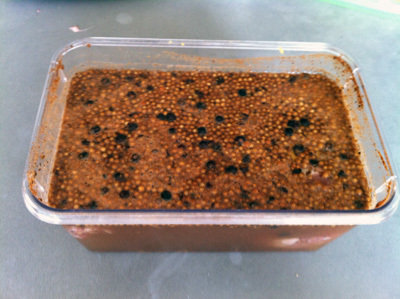 Reserve in an airtight container until needed. Mix together all of the ingredients (except the frying oil) until powders and salt are completely dissolved. Place pork loin in brine and refrigerate, covered, for 24 hours. Remove pork from brine, pat dry and vacuum seal. Cook sous vide in a 142°F Water bath for 2 ½ hours or until the internal temperature reaches 140°F. Preheat a water bath to 194°F. 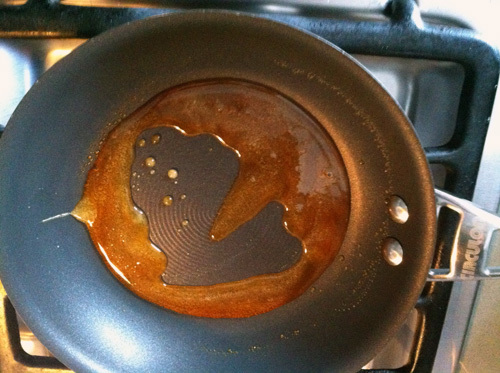 Cook the sugar in a non-stick skillet over medium high heat until it becomes caramelized and is a dark brown color. Pour the apple cider into the pan. It will immediately seize up, but continue stirring until the sugar has melted again and liquid is all that remains. Allow the mixture to cool slightly. Peel, core, and quarter the apples and place in a vacuum bag with the sugar, cider mixture, butter, lemon juice, and salt. 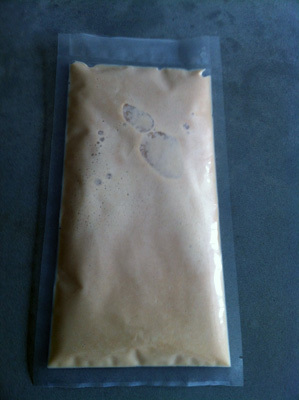 Vacuum seal using a chamber vacuum sealer or in a ziploc while displacing as much air as possible. Seal the bag and cook in the water bath for 2 ½ hours. Puree the contents of the bag in a blender. Cool and refrigerate until needed. 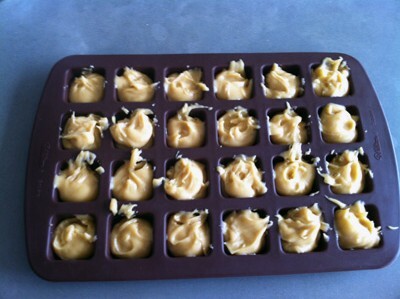 Bloom the gelatin in the milk until it is soft and pliable (about 10 min). In a pot over medium high heat, bring the milk, gelatin, butter and salt to a boil ensuring all the gelatin is dissolved. Add the flour all at once and stir until a ball of dough forms. Cook the dough for an additional 2 minutes to remove the raw flour taste. Transfer the dough to a stand mixer fitted with a paddle attachment. With the speed on medium low add the eggs one at a time, ensuring each one is incorporated before the next addition. Add the chestnut puree and mix until well incorporated. Fill a silicone brownie pan with one tablespoon of dough per square and then refrigerate for at least three hours until needed for final preparations. Preheat a water bath to 175°F. 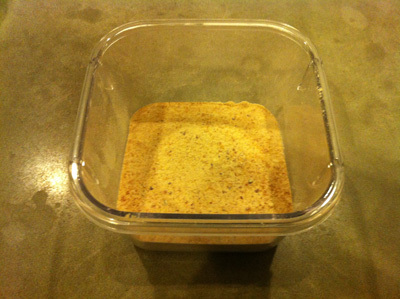 Place the cold milk in a tall sides container and disperse the iota carrageenan and konjac gum. Add the chestnut puree, heavy cream, hazelnut oil, sugar, water, and salt and blend with a stick blender until the mixture is smooth and consistent. 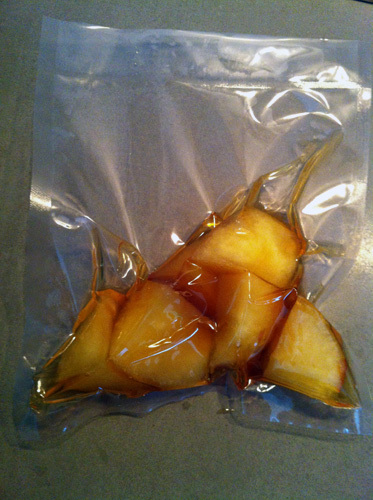 Vacuum seal or place in a ziplock bag with as much water as possible removed and place in the water bath for 5 minutes. This will allow the iota carrageenan to hydrate. 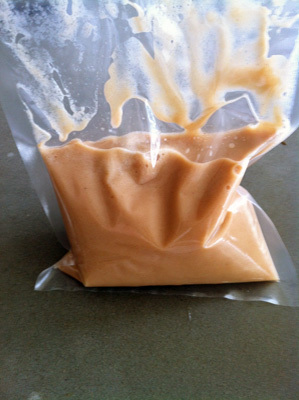 Refrigerate the bag until the mixture has cooled and formed a gel (about 30 min). 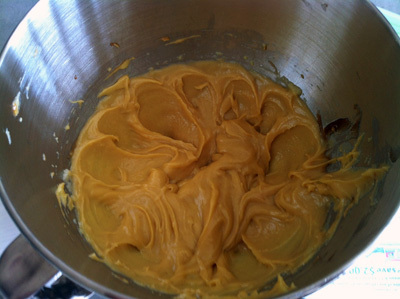 Puree the gel in a blender until fluid and place in a 1l whipping siphon. Refrigerate until final preparations. 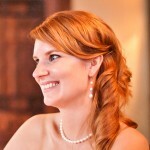 Preheat the oven to 390°F for finishing the chestnut puffs. Heat the frying oil for the chestnut puffs to 365°F. Charge the chestnut cream filled siphon with 2 nitrous oxide cartridges and place in a pot of water with a temperature of around 160°F. Reheat the apple puree until hot but not boiling. 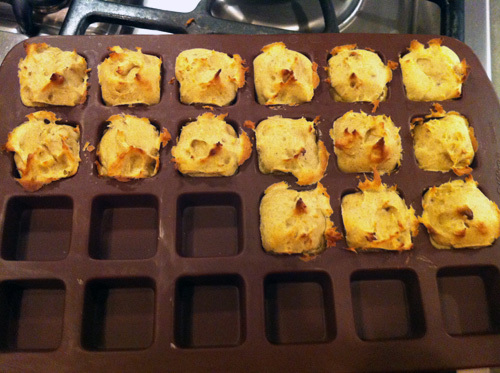 Bake the chestnut puffs for 10 minutes. Using a small spoon, remove them from the brownie pan and deep fry them in the hot oil for 3 minutes. Remove from oil with a spider and place on a paper towel lined plate to drain for a minute. Allow the oil to come back up to 365°F. Once the pork loin is cooked, remove it from the pouch and pat dry. Deep fry the pork loin for 30 seconds then remove and let drain on a paper towel lined plate for 5 minutes. Shake the chestnut cream filled whipping siphon vigorously and carefully fill each puff using the injector attachment. Dust each puff with the pain d’epices powder and plate. Plate the apple puree into the center of each plate as a bed for the pork loin. Slice the pork loin into 8 slices and plate in the center of the apple puree. Dust the pork with the spiced ash.